NATIVE BORN Justin Altamura and Thomas Fine trade guitars for synths on new album. Both born and raised in Napa, Thomas Fine and Justin Altamura have been musically attached at the hip since Fine gave Altamura his first guitar lesson. 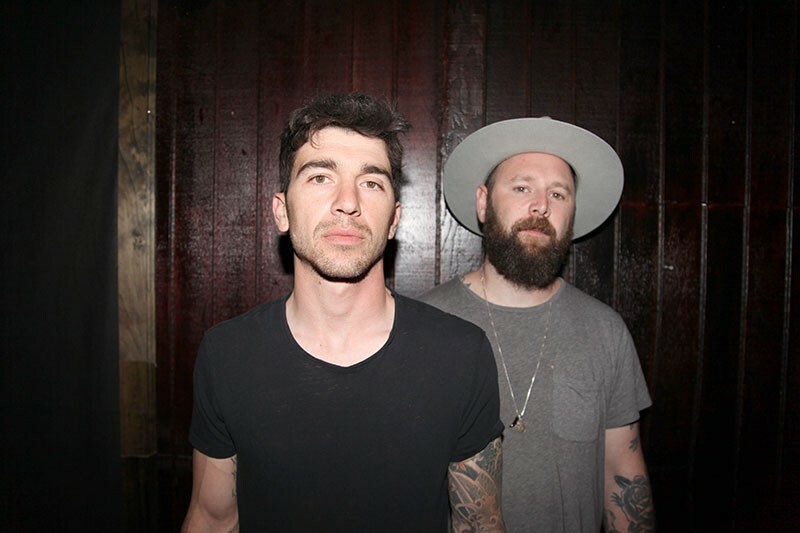 Together, the pair have toured nationally in rock band the Iron Heart, and now the duo are taking a new direction in electro-pop outfit Native Sons, starting with a debut release, Super American, out Friday, Aug. 4. As performers, Altamura and Fine got their first taste of the big stage in 2013, when the folks behind the original incarnation of the BottleRock Music Festival approached the pair two weeks before the event and asked if they could fill a spot in the lineup. Though they didn't exactly have a band at the time, they agreed, feverishly wrote seven rock songs under the name the Iron Heart and opened the inaugural festival. "I had to go to a psychiatrist," jokes Fine. "It was completely bizarre, absolutely surreal. I basically blacked out, but we got through it." From that first set, the Iron Heart became a touring act for three years, though all the while Fine and Altamura tinkered with making synth-heavy pop like the music they grew up on. "That kind of sound was always in us," says Fine. In 2016, Fine and Altamura put the Iron Heart on hiatus to focus on electronic exploits under the name Native Sons. "We sat down and said let's push this thing forward, work with the best people, and make it the best we can," Altamura says. To that effect, they built their own recording studio and used their connections to hire producers Chris Garcia (Adele), Shawn Harris (the Matches) and Jason Carmer (Kimya Dawson) to work on the seven-song album. They also worked with Sonoma County composer Charlie Foltz, who produces and licenses electronic music to companies like Samsung and Nike. Super American is a sophisticated blend of pop, dance, rock and new wave in the vein of M83 and Phil Collins. The album's single, "Lay Your Lover Down," a darkly textured gem, has already been heard on over a hundred college radio stations this year, and the pair plan to do extensive touring in the fall to support the record. "We're prepping to do it big," Fine says. "We want to make the needle move." Even with eyes on the horizon, Native Sons still see themselves as local guys. "We have a love and appreciation of the scene," says Fine. "Napa keeps calling us back, this is our home. "We would love to contribute to the place that's nearest to our hearts." 'Super American' is available Aug. 4 on www.ntvsns.com and all major streaming and download services.